I hope that all my Canadian friends and family had a wonderful Thanksgiving. Autumn is by far my favourite time of year, especially going for long walks in the crisp air with the smell of freshly fallen leaves. Hopefully my little ladybug will be out of the hospital before winter begins. It’s looking promising. Like I mentioned above my princess is still in the hospital, we are most definitely on the home stretch though. Today a friend asked me how I can handle being at the hospital and away from home day after day, week after week, and now month after month. Truth be told the hospital feels more like home right now than my own house. The nurses have become our extended family and love my ladybug as much as any other family member would, in fact there are a few nurses who have gone above and beyond their duties and have become close confidants for me. The house I go home to some nights is just plaster walls and a roof. Once my daughter is discharged from the hospital it will become a home again. Looking back to when she was first admitted we have come so far. A 10 cm portion of her small intestine filled with ulcers was removed, a milk protein allergy was found to be the cause of a lack of peristalsis, an EEG test confirmed a hypsarrythmia in the brain waves. Not to mention countless tests, and 5 blood transfusions in nearly as many days. Today my beautiful 10 month old princess is tolerating her feeds, beginning to gain weight again and is no longer in pain – aside from the *2nd* tooth that broke through today. YAY!!! I even went out last night to buy her first toothbrush. Brought tears to my eyes – milestones like these are amazing but a teeny bit sad because my little ladybug is starting to grow up. 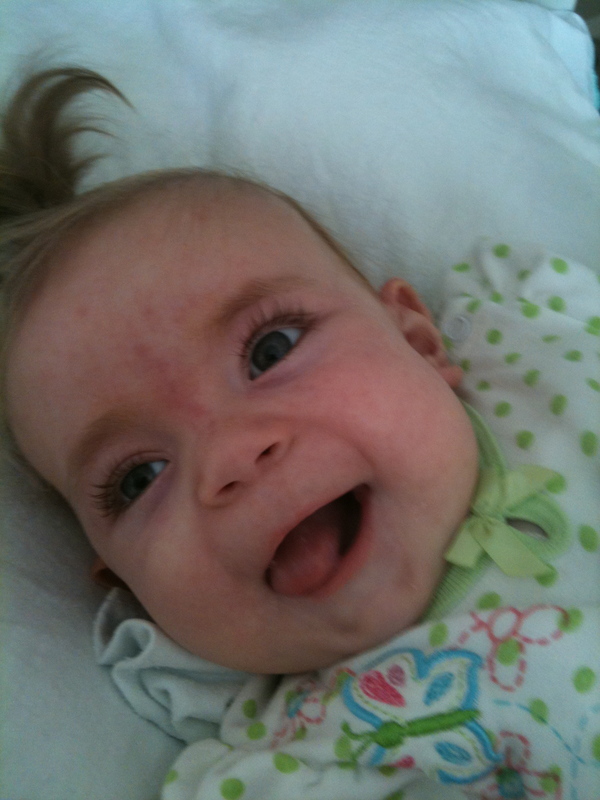 Last week the wee princess had her 2nd EEG to see how well the Vigabatrin was helping the hypsarrythmia. Yesterday, the Neurologist along with his entourage of mini doctors came in to discus the results. The hypsarrythmia was still present on the EEG ( I had a feeling) however, I was not prepared for what he would tell me next. It hasn’t decreased. Which means that the Vigabatrin had failed. Aside from a Steroid type injection (which has a list of side effects that could wreak havoc on a healthy persons system let alone a wee baby with medical issues), at this time there is nothing else they can do. For the first time I was speechless – what are you supposed to say at that point? I knew when we started this medication it may not work and the other option was much worse. Even still – I really felt like it would help. Now it’s a matter of waiting to see what long-term effect it could have, and in the mean time hitting the books and medical journals to see if there are any other possible treatments aside from the steroid injection or the diet. At one time it was thought that my ladybug had a form of infantile spasms – this has been ruled out. There is a type of special ketogenic diet that has been linked to helping children with seizures, and was suggested as a preventative measure. However at this point with finally finding a formula that LB can tolerate I’m not ready to start experimenting until her tummy is completely 100% back to normal. Today….we almost had the MRI. It was an incredibly anxiety filled day waiting and waiting. Alas, it never happened. As of now we have one booked for tomorrow at 12:30. I’m not going to hold my breath, but at least we are getting closer. The current pediatrician who is pregnant came in after the huge cluster mess of today and mentioned that if the MRI isn’t done by tomorrow she is going to start spitting fire. Anyone who has ever been pregnant or even around a pregnant woman when they are pissed off and on a mission knows that it won’t be pretty. I’ve no idea when I’ll get the results from the MRI, but will update as things come along. sounds positive!! Yay for Teeth and so glad to know she’s not in pain. You’re amazing. Can you imagine what you can accomplish now that you’ve tackled all of this! Mamas rock. I am new to CDG. My daughter was just recently (finally) diagnosed at age 20. She has never had serious challenging issues your little Lady Bug is enduring with internal organ problems, but she has had a couple of very close calls and I wanted to tell you that I have been AMAZED at how miraculous childhood resilience can be!!! You are an amazing mom! I can only attest to having spent 16 days in the hospital with my baby girl when she was almost 1-yr-old and I can absolutely relate to your making that your “home” for the time being. Yes, it is home because “home is where the heart is.” Your heart is with your daughter and that is perfectly understandable. PLEASE do give yourself time to take walks in the crisp air and relic in the beautiful fall surroundings; please do enjoy life to it’s fullest OUTSIDE that “temporary” home (aka hospital). Those walks and time to yourself will help you revive and re-energize your strength. I’m sure you’ve figured that much out by now. I will be sending lots of Lady Bug Hugs your way!!!!! thanks for the update. I love the way you write! Beautiful! You’re very welcome, and thank you. I truly love writing, it has become such an amazing outlet for me. Congrats on the teeth! The first time she bites you, you will have tears in your eyes (both from happiness and PAIN!). Keep your chin up and just think how big your little ones family has grown because the nurses do become her special aunties and not everyone gets to have a family that big! Filled with hope for you – another week – yay! Love to read these and think of you often.